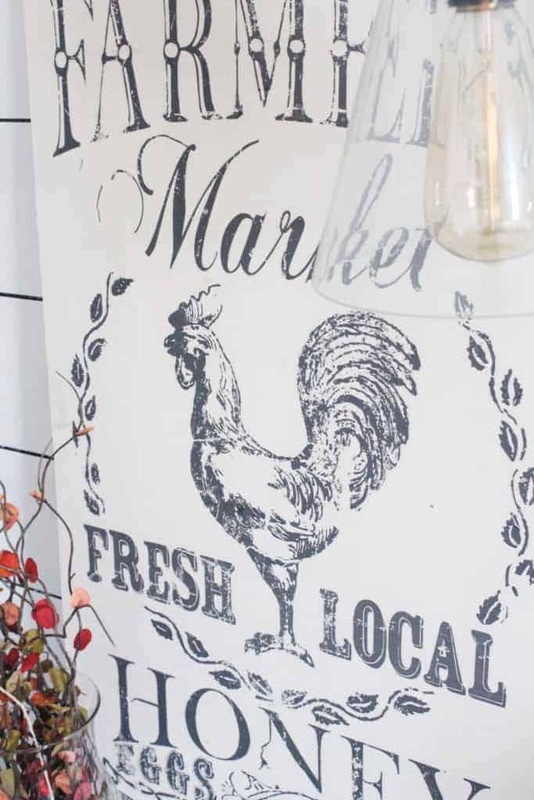 Vintage looking farmhouse signs are “the thing” these days. You can find them anywhere, even Walmart. They are so popular many companies are creating easy image transfers so anyone can make their own sign. I decided to create my own and show y’all how easy it is to create your own too! Here goes my Iron Orchid Designs easy image transfer to Wood Tutorial. 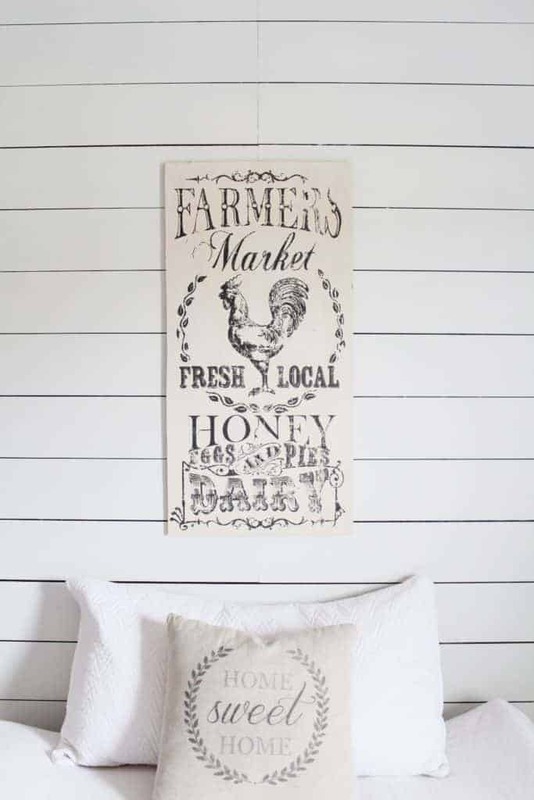 I know most people think, if I can buy a similar vintage farmhouse sign somewhere like Walmart, why would I create one? Maybe you have a certain size sign you want and you can’t find one to purchase anywhere. Or maybe you’re reading this post because you realize how simple it can be to create your own. So here we go. Purchase your image transfer. I believe they quit making this particular image transfer. You can see more of their other transfers HERE. Purchase wood. In my case, I cut an old piece of plywood I already had on hand. Tape the image where you want it. This is important because after you have started transferring the image you don’t want it to budge at all. Use a wedge that is provided or a spatula and press down the image to the wood. Start at the top and slowly peel the clear paper down as the image transfer sticks to the wood. At times you will have to repeat this step to the same area to get the image to stick. After you have transferred the entire image, cover with a clear coat. You can use any clear coat, wax, or modpodge to seal it. Note: The easiest way I found to get the image to “stick” while removing the clear cover was to lay both hands down on the image and push down while removing it. That’s it for my quick and easy tutorial on how to transfer images to wood. 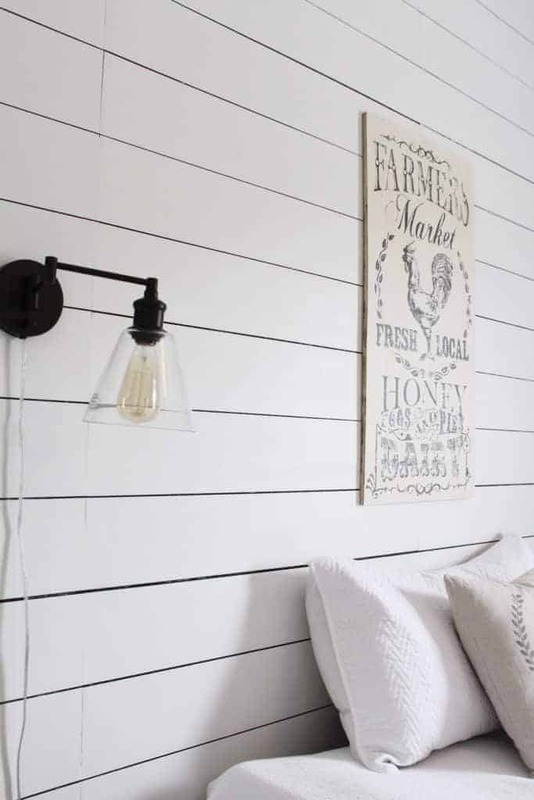 To see more of my post on creating this Shiplap with NO power tools click HERE. To see more easy and fun crafts from my website click HERE. Hope this post has inspired you to create your own vintage signs! Thanks for stopping by. This image transfer was provided by my friend Kristy at The Painted Nest. All of a sudden I’ve started hearing about IOD. I’m going to check them out! I love your sign. Yes, I’ve just recently been introduced to their products and I’m already in love! I love their products! I used paper clay and put them onto a trash can i got at the Goodwill! It was an awfull yellow, painted it chalk white. If i was doing this again i would spray the paper with sealer, FIRST! The chalk paint has a lot of water in it and it softened them up too much. I’m practicing using hot glue in the molds. I used their molds for my project. Just fyi! The stencils are lovely, too. Yes I need to try those! oh wow, that’s a good trick to know so thank you! That’s really neat. I’m going to have to try it! I’m still working on my image transfer skills (oh, the bubbles! ), but this is definitely a cute technique. I never thought of putting a clear coat over my project, but it makes so much sense. Thanks for sharing at the #happynowlinkup! That is really beautiful art! It looks professional and commands the whole wall. Just what I am looking for in my new kitchen.I shall definitely have a go at this. TFS. Great project Lindsey, I keep seeing IOD popping up on blog land and their stencils are gorgeous, I’m going to have to give that site a visit and try them myself! Thanks for sharing your tutorial at #FridaysFurnitureFix! Love your project! Thanks for sharing at the #InspirationSpotlight party @DearCreatives Pinned & shared. Oh thank you so much for the feature! This makes my day. Have a great weekend. Hi Lindsey, I’m Featuring your sweet Transfer DIY tonight over at the What to do Weekends party over @ Shoestring Elegance. Thanks so much for sharing. Congratulations! Oh thank you so much! This made my day. Have a great weekend. Your sign looks fabulous Lindsey and I’m so glad you shared it at Create, Bake, Grow & Gather this week. I’m delighted to be sharing it at tonight’s party and pining too! Thank you so much, this made my day. Have a wonderful weekend! Thanks Kathryn! I will check it out. Take care and have a great week. I love the Iron Orchid rub on transfers…can they be used more than once? No, unfortunately they can only be used once. That would be awesome if they were re usable though!